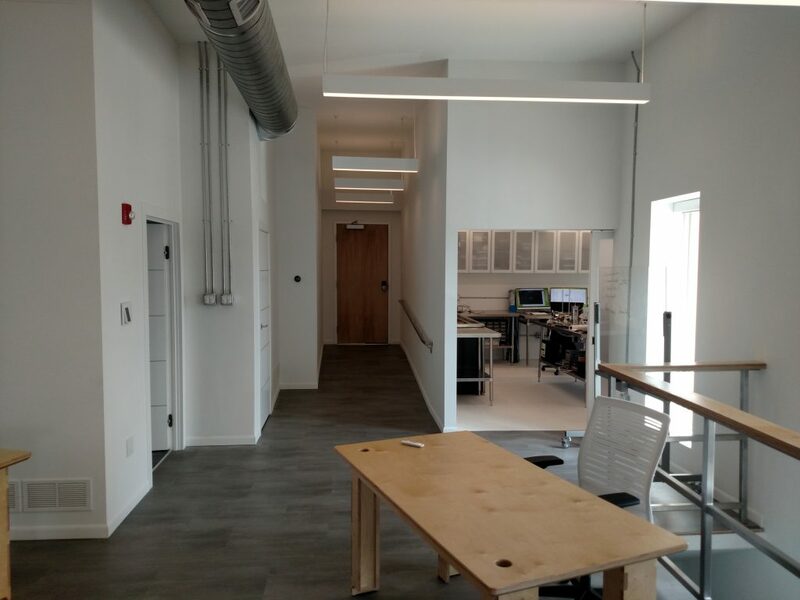 Growing from a startup in 2012 to an established medical device development company in 2016, PECA Labs needed a new office. The new space, 4424 Penn Avenue across the street from UPMC Children’s Hospital, needed to project a polished image while providing room to grow. The aesthetic goal was to make the space as clean as possible: white walls and fixtures, gray floors, brushed steel, and translucent paneling are punctuated with laminated Baltic Birch furniture. 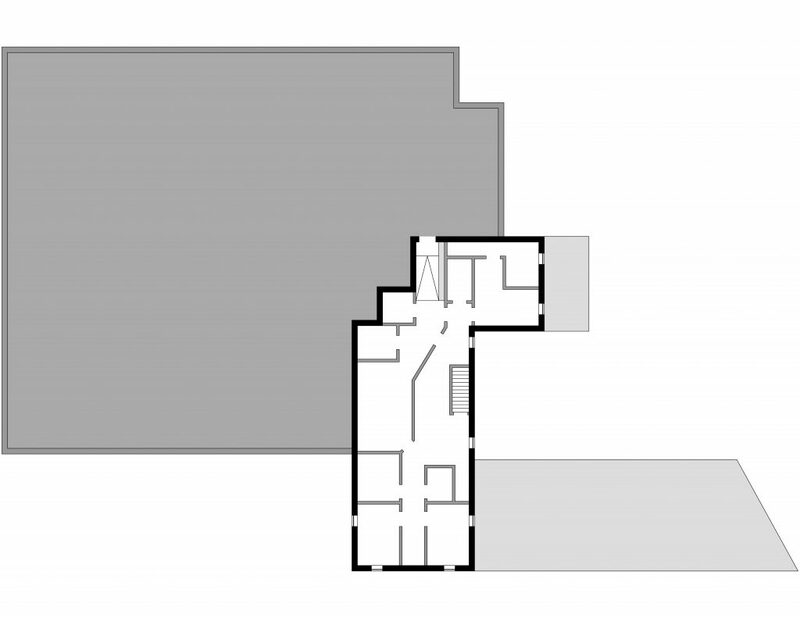 The space was formerly a medical specialist’s office with small rooms, low ceilings, tinted glass, and beige walls. We demolished the interior walls and removed the drop ceiling revealing a spacious volume. 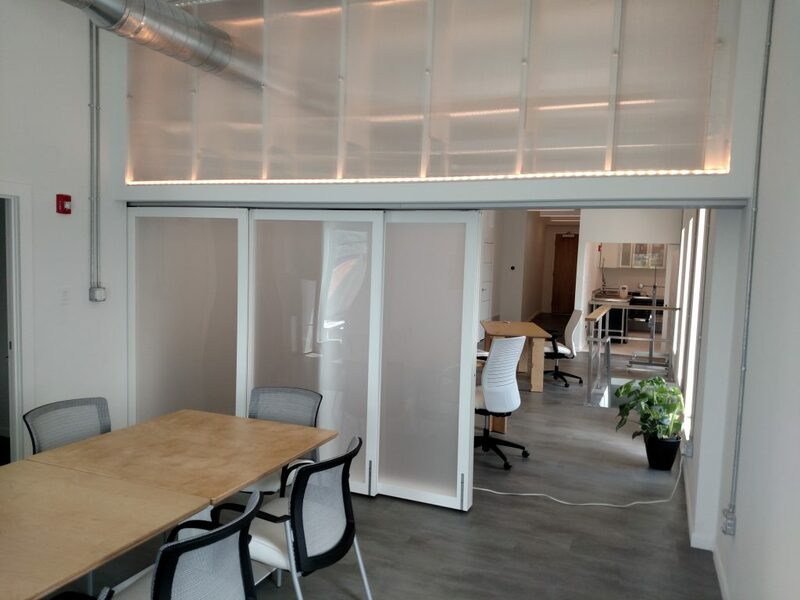 Translucent sliding doors (Raydoor) and translucent paneling above allow for flexible separation of the conference room. Square tables of laminated Baltic Birch are able to be dynamically rearranged. Smartphone controlled LED lights embedded in the translucent room separator cast ambient light throughout the room in any color. With the sliding doors closed, the conference room is intimate and quiet. Even the most soft spoken visitor can be heard at the table which is expandable to 12 seats. Throughout the office, there are four outlets at every box to support the company’s dynamically changing needs and future expansion. 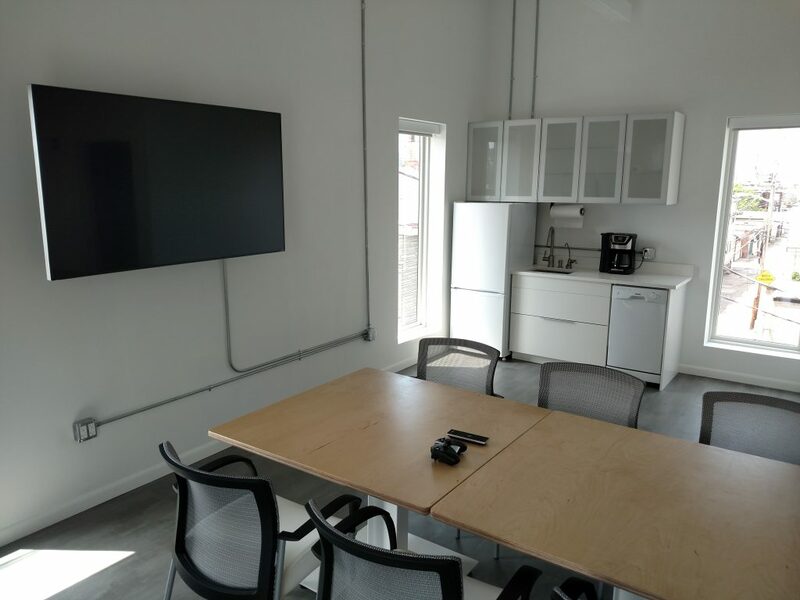 Exposed steel conduit is attached to the surface of the building’s solid brick walls and provides clutter-free power to the conference room monitor. PECA uses an Nvidia Sheild to cast presentations wirelessly from a connected laptop or phone. The kitchenette includes a built-in water purification system, a near-silent garbage disposal, and a dishwasher for convenience. Smart controls like Wink and Nest are used to manage temperature, security, and lighting. Blinds throughout the office are controlled by remote. 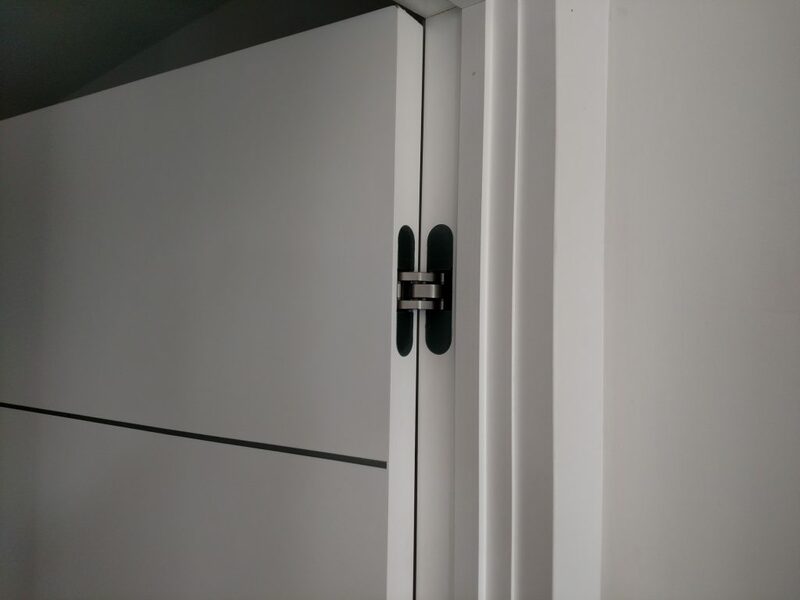 Contractor and building owner Richard Otter ensured that the project was completed with a high degree of fit and finish. Embedded vents in the duct work and careful installation through the translucent panels were at his insistence. 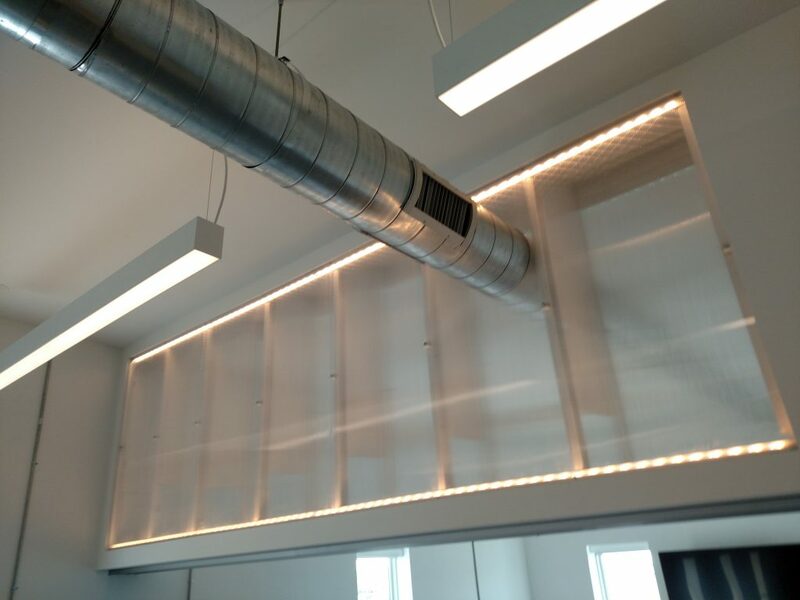 All of the lighting in the office is LED and all of the fixtures are dimmable. Hanging lights are Neoray by Cooper and recessed lights are by Texas Fluorescent. LED lights embedded in the translucent partition wall are Hue by Phillips. Office shown with partition closed. Four desks and four square tables were custom fabricated based on my specification. 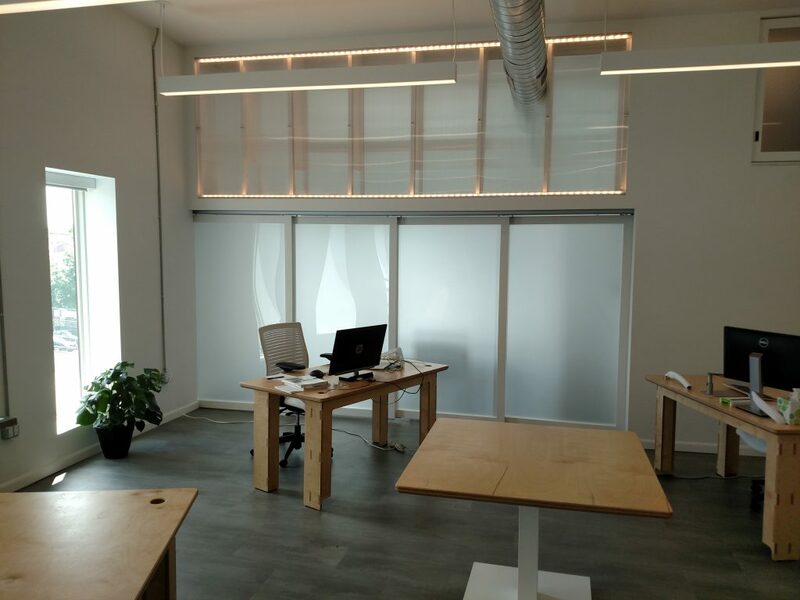 Desks are constructed entirely of Baltic Birch ply laminated in thicknesses up to 1.5″ and were milled and assembled at a fabricator based in Ohio. Tables include a Baltic Birch ply surface laminated to 1.5″ and are supported by a white powder-coated steel I-beam base. Bathroom and HVAC doors include a concealed hinge, magnetic latch, and an acoustically deadening core. During operation the HVAC system is whisper quiet, offering a soft white noise that blankets the space. The front door is at the top of a short ramp, offering new visitors an elevated view of the space as they enter. Adjacent to this is the laboratory which is differentiated by having a white floor and is separable by a translucent sliding door. Baltic Birch tops the brushed steel railings around the stairwell leading to a secondary entrance. 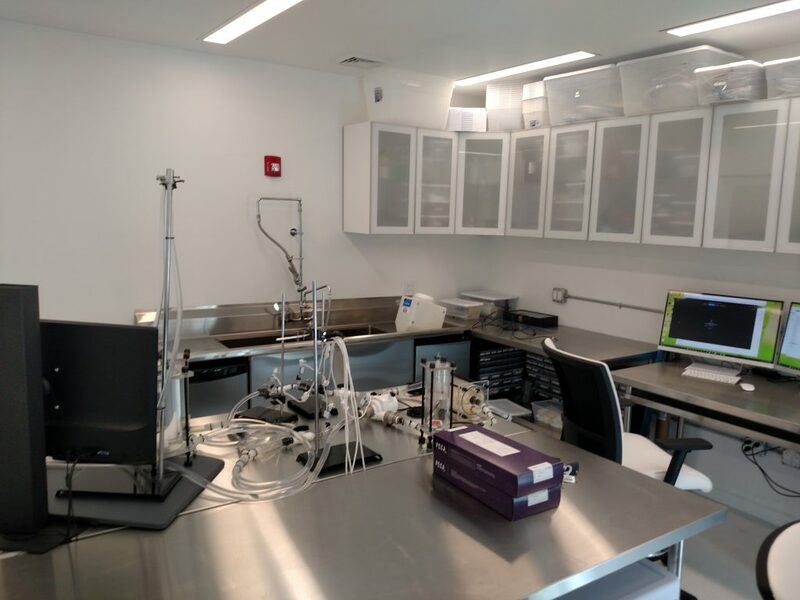 The laboratory is furnished with 14 gauge stainless steel tables and includes a two bay deep sink. Outlets are placed both above and below tabletops. The lab also has an outlet supported by the building’s instant-on backup generator so power outages do not disrupt crucial simulations. PECA Labs’ proprietary mock loop is shown testing one of the company’s pediatric heart valves. The office is in Suite 201 on the second floor of a larger building. The building is the result of the combination of several old rowhouses into a single building, with additional space added later. During demolition we discovered rough-sawn ceiling joists and had a chance to see the original brick walls. 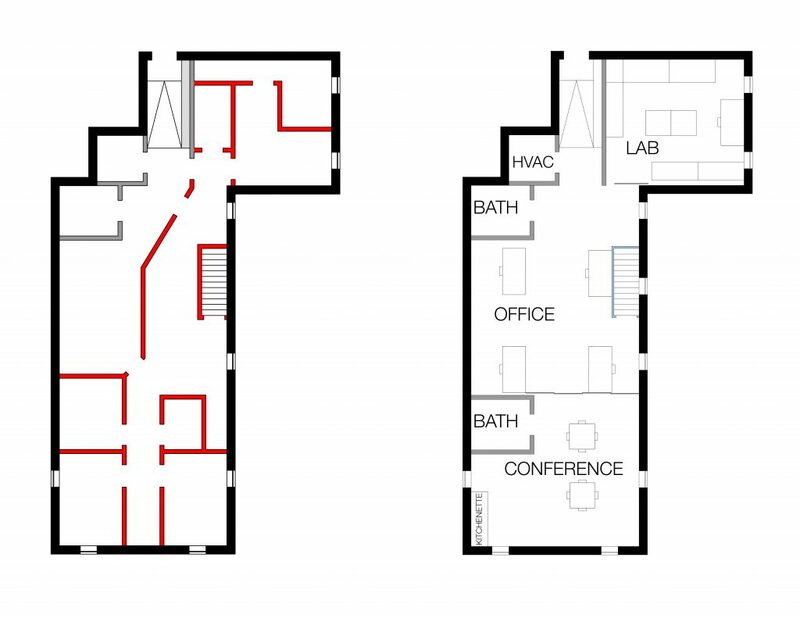 On the left, red shows walls to be removed from the former medical suite. One the right is the new PECA labs layout. 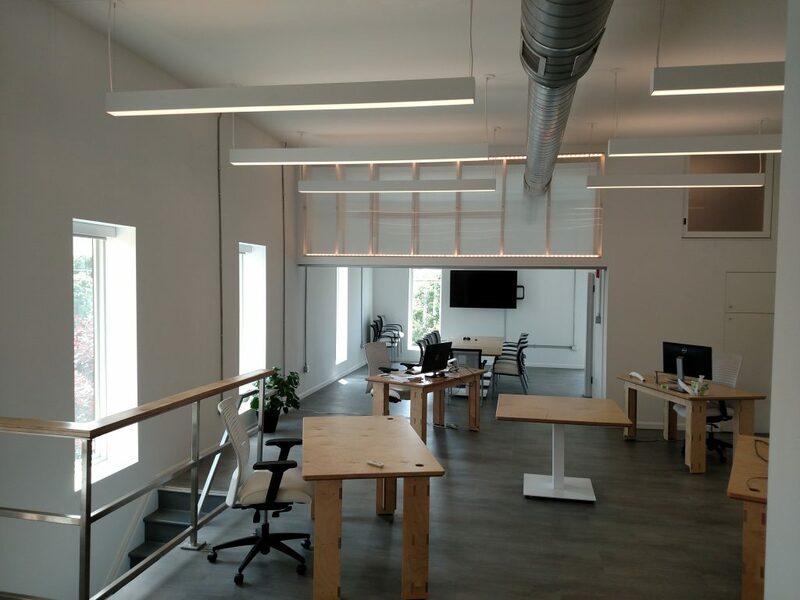 The new layout is open and allows for the nimbleness that an evolving startup needs. As the company expands, the property owner has committed to making other spaces in the building available for PECA to grow easily without interrupting its core operations.